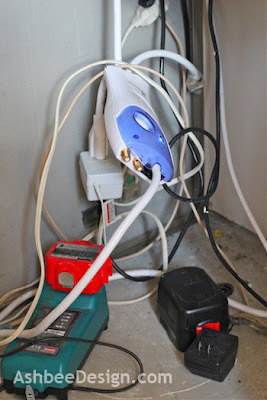 After completing my bird nest solution I decided to tackle the power tool charger dilemma. We love our cordless power tools - but the charging station has become a nightmare! 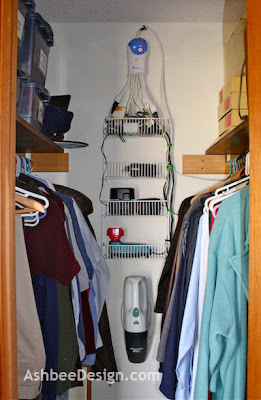 I purchased 2 double wire shelf units at Lowe's (under $8 each) and mounted them to the back wall of the closet. The electricity in this closet also powers the Dust Buster and TV we built into the bedroom wall in the next room so there are A LOT of plugs in here. He already had a Squid Surge Suppressor which is a great gizmo for dealing with blocky chargers - great but awkward. 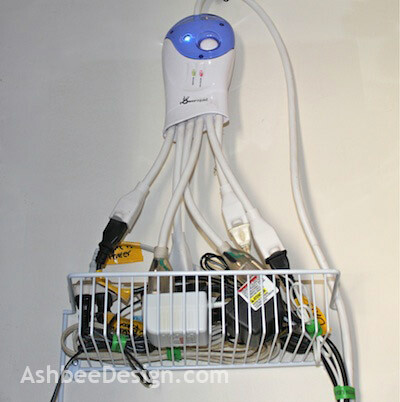 I decided to hang it above from a hook and collect the block chargers in the top shelf of this unit. The end of each is labeled in bright yellow duct tape - Tivo, TV, etc. The cords that lead down to the charging units on the lower shelves are then gathered together and wrapped with the green velcro tape from lettuce. Yup! 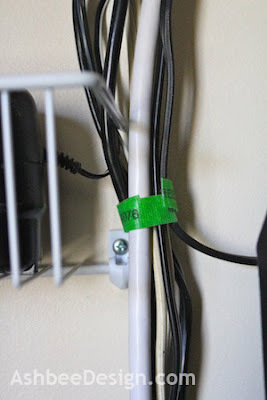 I save the velcro stuff used to wrap green leaf lettuce in the produce department from grocery shopping and I use it for wire control. The price is right and it does a beautiful job. Every little bit of recycling helps! The end result is not particularly beautiful but absolutely functional and a huge improvement. Extra batteries and the chargers for screw drivers, etc. now have an organized home near a power source. Really clever idea, I never know what to do with all the chargers!